Gujarati Speciality RICE DHOKLA in a superb Presentable Mode 🙂 🙂 A Healthy, Super Spongy, Delicious RICE Dhokla is a superb starter or snack which can be served as a meal or with meal or as a perfect partner with Tea/ Coffee. No Colours are used for this recipe. 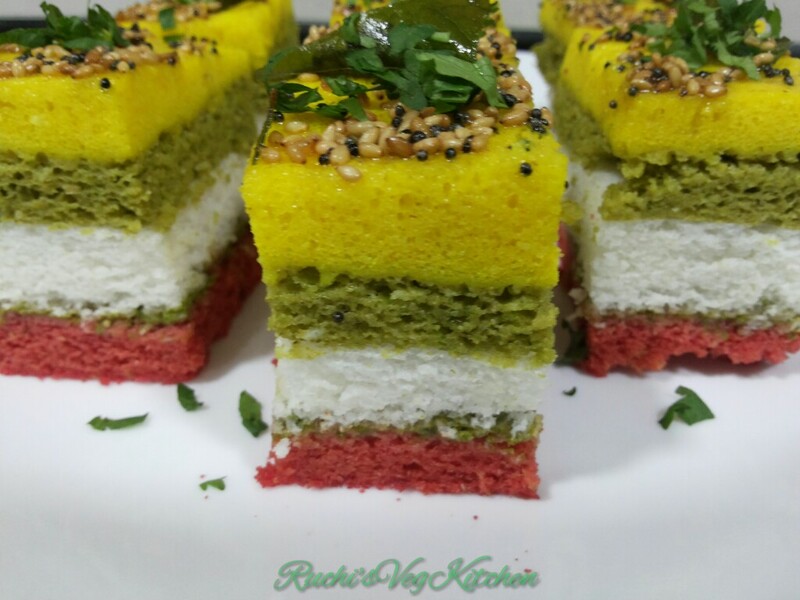 So checkout the never fail and super easy method for this Tempting MULTI COLOR DHOKLA. I made This Dhokla in 2 batches and then assembled, as till the time 4th layer get cooked the first layer may get over cooked or will lost the softness. 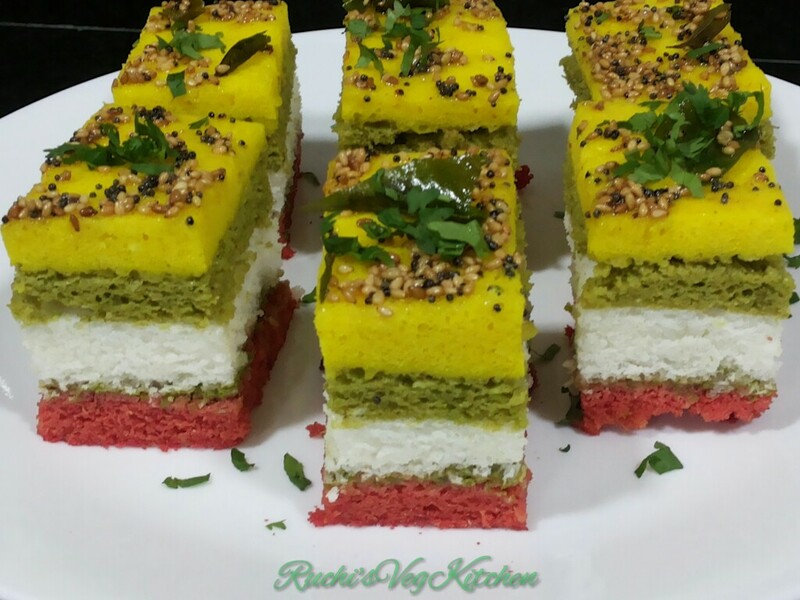 The same Layer Sandwich Dhokla can be made from left over Idli batter also. So now Lets Checkout the recipe ..
Wash and peel Beetroot. Cut into small pieces. In a small pan take chopped pieces and add little water. Cover and cook on slow flame, till beetroot gets tender. Take sufficient water only. Once cool Grind to a smooth Paste in a mixer. If using Spinach for Green Layer, blanch the spinach and grind to a smooth paste in a mixer. Green Coriander Chutney i have already posted on blog, here the variation is just i added a small bowl of fresh MINT LEAVES to that. Now how to make Dhokla Better.,.. Take rice and urad dal, wash nicely. Soak them with sufficient water for at least 4-5 hrs. Drain access water. 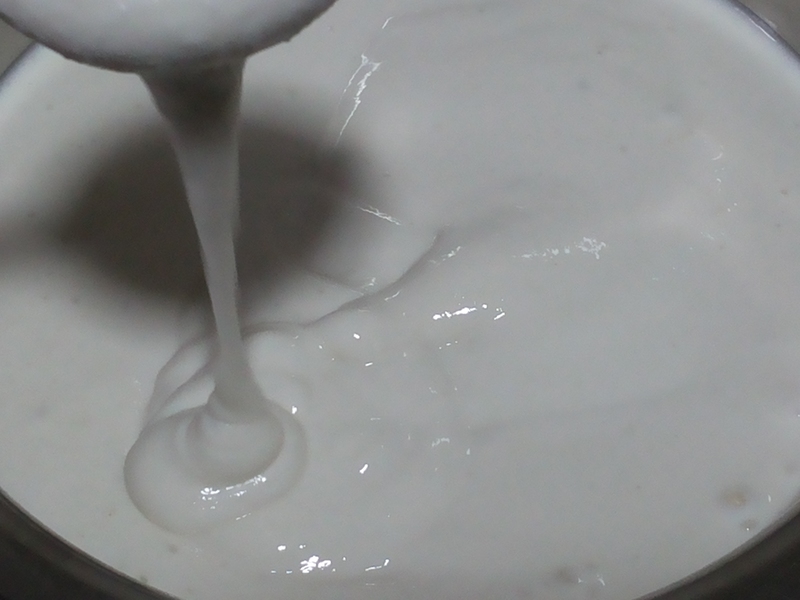 Add curd and grind to a smooth paste. Batter consistency should be little thick. Keep this batter in a warm place for at least 5-6 hrs. This batter may not rise as generally we see for Idli batter, but no problem, it will work perfectly. Now how to proceed .. 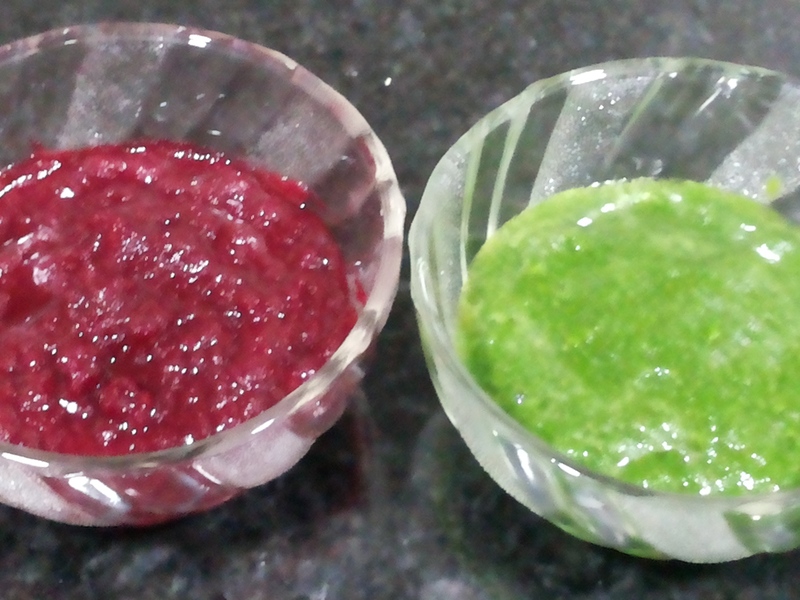 Above is the image for Beet Puree and Coriander Mint Chutney.. Mix the Dhokla Batter nicely. Take a portion of batter, add salt, 2-3 tsp water and Beet Puree. Mix Well. Once steamer and greased plate get hot, add a spoonful Eno to batter. Mix very nicely and immediately pour this batter on hot greased plate. Cover the lid and allow it to cook for 6-8 mins. After this time, open the lid, if u find the Dhokla is bit firm pour Green Chutney on it, spread nicely and cover the lid. Take another portion of batter. Add salt, 2-3 tsp of water and mix well. Add Eno , mix it and pour on Chutney layer. Cover the lid and allow it cook for more 8-9 mins. Before taking Dhokla out, always do toothpick taste. if toothpick comes out clean , take the plate out and allow it cool completely. By the time lets make another 2 layers.. MAke sure to use same sized plates for perfect assembling..
Take a portion of batter . Add Salt, 2-3 tsp water and Green Chutney and mix well. Add Eno and pour on hot Greased Plate. Cover the lid and allow it to cook for 5-6 mins. Take a portion of batter. Add salt, 2-3 tsp water, Turmeric Powder and mix well. Add Eno and Pour on Green Layer. Cover the lid and cook for 7-8 mins. Do the toothpick taste. If done, take the plate out and allow it cool completely. Once both the plate cool fully, its time to assemble..
take a big plate , turn out the Dhokla Plates carefully as we do for baked cakes. Tap from backside and it will come out. Arrange them properly. I applied a little butter on White layer then placed Green and Yellow layers. by applying butter both set of dhokla will stick nicely and will add a little moisture to taste. (As Green layer is made from chutney so didnt applied chutney at time of assembling. At this stage one can do microwave for 1-2 mins or put in hot steamer for 3-4 mins, its optional not needed compulsory. Take Oil in a kadai, add Mustard seeds. Once it starts crackling add Red dry chilli , curry leaves, sesame seeds. Then add hing and spread this temper on dhokla. Now with a big, sharp knife cut Dhokla with desired shape. Square or diamond. Sprinkle Coriander and serve. Serve with Green Coriander chutney or Tea / Coffee or Tomato Catchup..
Hope you all will enjoy this superb Dhokla as much i did.. Will wait to listen from you . Yum. Never tried dhokla this way. Amazing. Great share.